Are you guys talk'n bout a tail bleeder LED (Bistro - clicky) or locator LED w/Narsil? For Narsil I use somewhere between 2K and 15K, depends on the LED(s) and visibility of the LED. Well, it sounds like he is talking about installing an indicator LED using the tailcap bleeder pads. So it would remain on 24/7 and drain the battery continually. 50k ohm resistor tends to have the final output be around ~0.050ma from my testing, so a little over 1ma per day of drain. This makes more sense and it also means you don’t need a resistor, or at least as big of one. But in this case you can’t use the bleeder resistor pads. I am not sure what pads you need to use but I think the voltage divider pads. Never used an indicator LED with narsil before myself. Ooops, removed this post. Lexel is using an older version of NarsilTriple, so not sure about the Indicator LED support. What would you recommend for a broken thorfire s70s driver? The TA30 was designed for the L6 and S70. I love it in my L6 although it can get really hot if you run it on turbo. Are you guys talk’n bout a tail bleeder LED (Bistro – clicky) or locator LED w/Narsil? For Narsil I use somewhere between 2K and 15K, depends on the LED(s) and visibility of the LED. I’m not sure what aplication X3 is using. I was talking about a side switch led for the L6, not tail switch. I don’t know much about the “indicator” or “locator” led. My plan was simply to have the side switch light up whenever the tail switch was turned on. When not using the light I will click the tail switch off which cuts all power. I want LVP, so I got Lexel to install Narsil v1.2. BTW, I have a 1.45 milliamp drain on one of my drivers. Is that considered high? It has had zero effect on battery life so it doesn’t seem to be a big deal. BTW, I have a 1.45 milliamp drain on one of my drivers. Is that considered high? It has had zero effect on battery life so it doesn't seem to be a big deal. Narsil is wayyyy lower, after you wait 10 secs or so from turn OFF. Did you wait long enough? In the newer versions it's reduced to 5 seconds or so. It should be 0.021 mA without R1/R2. If you are using R1/R2, depends on what values you use. I typically use 192K and 47K - 10X less drain for the old resistor values, so resulting drain is 0.038 mA. 1.45 mA is like 38X greater. Narsil is wayyyy lower, after you wait 10 secs or so from turn OFF. Did you wait long enough? In the newer versions it’s reduced to 5 seconds or so. It should be 0.021 mA without R1/R2. If you are using R1/R2, depends on what values you use. I typically use 192K and 47K – 10X less drain for the old resistor values, so resulting drain is 0.038 mA. I was asking about an FX-30 driver I’m using. Also, what kind of drain do you get from a zener modded driver? My drivers arrived today, they look very nice. Thank you for doing this, can’t wait to put them in to use. EDIT : Just finished putting one of the drivers in a Skilhunt H02, re-flowed the original emitter to a Noctigon MCPCB, the UI is great with lots of options and the ramping is fast and smooth. What a wonderful UI ! I love the ramping, really intuitive, and fast at the same time ! Thank you very much once again Lexel ! Received mine today, as well, that was quicker than expected, thanks. Thank you Lexel, received the drivers Tuesday! Got mine installed & working. 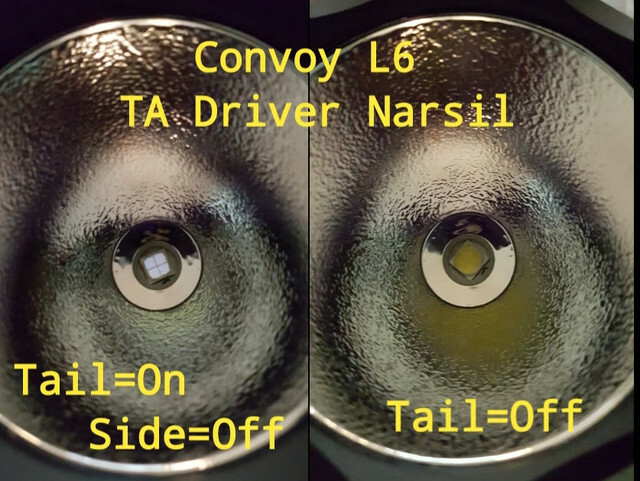 Convoy L6, inspite of discovering my led is in backwards (reverse polarity). Still trying to figure out how to get ramping to continue in the same direction. It seems to want to change directions. Edit: nevermind about ramp direction, got it now. Also, can I switch it from initially coming on at turbo with rear clicky, to the 2 blinks? Maybe it’s on a moon setting? How do you turn the light off with the side switch, press and hold? The illumination is way lower than moon or firefly. If it’s normal, it’s not a bad way for me to tell if I have turned tailswitch off, since I don’t have illum switches. Here’s how mine works… your results might vary. TA Driver Infineon LDO Tactical 65° with Narsil V1.2 ? -1/2 press of rear tail switch = momentary on (in Turbo) for signaling or instant glimpses. -Full click on rear tail switch turns on to Turbo. >-Click = On / Off (with memory). >-Click and hold = Ramping up or dn. >-Long pause (1.5+ seconds) between Click & Holds continues ramping in the same direction. >-Short pause between Click & Holds reverses ramping direction. >-Short side switch click , turns off at any point in ramping and saves that level in memory, for when side switch turns it back on. >-Tail click to off, or lockout, erases brightness level memory. C) Nothing until side switch is pressed. v1.2 has low voltage protection, but no temp control. If you do have temp control, then you have v1.4 and no lvp. I understood it that tail switch modes had to be programmed into the firmware. They are not user adjusted. Lexel told me it was a few lines of code that had to be altered to get the tactical setting. I specified temperature control, and they were marked as such, so I guess it is V1.4. I misunderstood those tail switch options as being user defined. Turbo is the only way to have a momentary function, so its not bad in that respect. And a quick click of the side switch turns it off. Looking across my acreage, I can quick scan a lot of ground in momentary mode in a second or two with it. The ramping is awesome, and a lot more user friendly to fine tune the levels than I expected. The faint LED could be an Infineon vs SIR800 difference, guess we’ll see. I agree with this assessment. I have had this happen to me as well with 7135’s on 2S drivers. There’s only one 7135 on there so it looks pretty easy to swap out. Maybe you have an old driver you don’t need that you can strip a 7135 off of. If not, MTN Electronics sells them super cheap. I actually have a stip of 7135’s, just have to get some more practice in before attempting. I think dealing with these itty bitty parts is how I messed up my original driver (resistor mod), total noob, and not steady 63 yr old hands. BTW, there’s 8 7135 on one side and the single on the other….??? Oh yeah, post #102 shows the backside. So 9 in total. I wish I knew how to narrow it down to find the faulty one. Removing all of them and cleaning the pads is not too hard, but soldering new ones would be a pain by hand. You’d need a hot air reflow station and solder paste to do it quick and easy. Its some pretty bad luck. If you really want to fix it, maybe ask Richard at MTN if he could do it. I hope it’s a rare occurrence. Package delivered today. I’ll force myself to wait for the solder station I ordered that’s scheduled for delivery wednesday before starting on the lvp mods for the 2s light but will install one as-is in the D01. I’ve been searching for another grey D01 but the major sources are out of stock so it will remain 1s3p until I find another, make a 2s battery tube, or cut and extend the 1s tube.